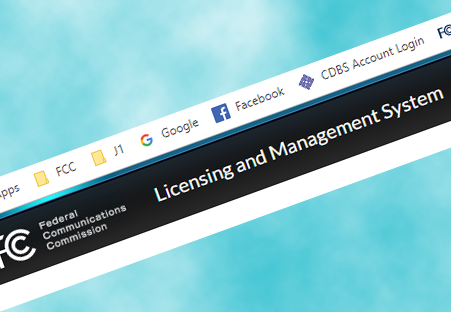 Based on credible reports from Commission staff, REC can confirm that the FCC Media Bureau plans to require the use of the Licensing and Management System (LMS) for renewal filings in the upcoming cycle. The first renewal filings for Maryland, D.C., Virginia and West Virginia must be filed on or just before June 1, 2019. LMS has been used primarily by television broadcasters for most of their application needs. In television, assignments and transfers still go through CDBS. In full-service radio, LMS has been used only for ownership reports. LPFM stations are not required to file ownership reports. The LMS form is called Form 2100. Similar to the IRS 1040 tax form, Form 2100 uses "schedules" and other variations in order to handle specific needs of the application. We have not yet seen the presentation of how the form will be laid out. Since the existing renewal form (Form 303-S) is fairly simple and straightforward, we expect the LMS version of the form to be the same. Unlike CDBS, LMS uses only a station's FRN for access. It does not use the separate CDBS password. LMS uses a different syntax of application reference numbers consisting of an all-numeric serial number. The concept of using suffixes (BNPL, BLL, BPL, etc.) , which dates back to the 1920s will be going away with the conversion to LMS. In REC systems such as FCC.today and FCCdata.org, we add "psuedo-suffixes" to application reference numbers in order to indicate the type of application they are. Work will need to be done on REC's side to implement the use of LMS for radio in our systems. Its important to note at this time that only renewals are moving to LMS. There may be a time in the future when other application needs will move from CDBS to LMS. REC has already advised Commission staff that the short notice may be impactful to some LPFM stations, especially since LPFM has a higher ratio of "self-filers" (those who bypass a consultant to attorney to do their own filings) who will now have to learn a new system. The Commission is considering offering tutorials, webinars and other training to prepare for this change. At this time, the changes to Form 2100 have not yet been approved by the Office of Management and Budget. The Media Bureau is expected to announce the change during NAB next week in Las Vegas and it will be followed up by public notices. In response to concerns that if LMS is not rolled out in time for the first renewals, staff assures that applicants will only need to file once. If you feel more comfortable having us file your renewal for you, please contact REC at 1-844-REC-LPFM or use the Contact REC link at the REC website https://recnet.com.